On this page I put together a collection of force problems to help you understand forces better. The required equations and background reading to solve these problems are given on the friction page, the equilibrium page, and Newton's second law page. 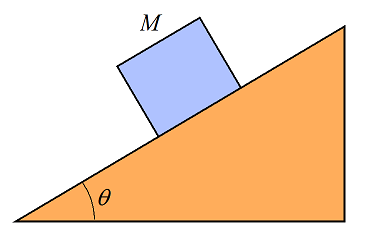 A block of mass M is sitting on a surface inclined at angle θ. Given that the coefficient of static friction is μs between block and surface, what is the maximum angle θ so that the block doesn't slide? 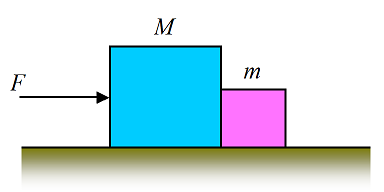 Two blocks of mass M and m are sitting on a surface inclined at angle θ. The blocks are touching. 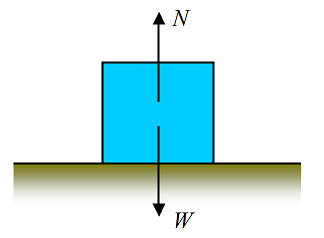 The coefficient of static friction between the smaller block and the surface is μs1, and the coefficient of static friction between the larger block and the surface is μs2. Formulate a mathematical inequality for the condition that no sliding occurs. There may be more than one inequality. 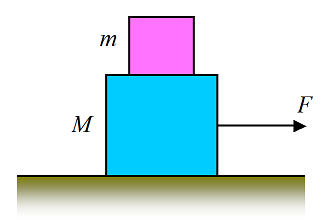 A block of mass m is sitting on a block of mass M. The bottom block is sitting on a horizontal floor. 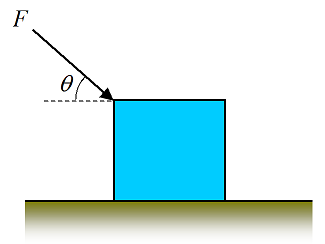 The coefficient of static friction between the blocks is μs1, and the coefficient of static friction between the bottom block and the floor is μs2. What is the minimum pull force F on the bottom block so that the blocks begin to move? 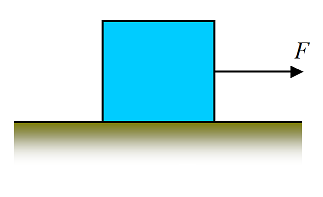 Given that the coefficient of kinetic friction between the bottom block and the floor is μk, what is the maximum pull force F so that there is no slipping between the blocks? The hints and answers for these force problems will be given next. The force of gravity pulling down on the block is F1 = Mgsinθ. 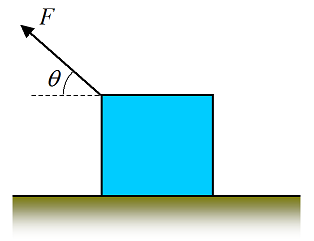 The maximum friction force opposing the sliding is F2 = Mgcosθμs. At some angle θ the block will be on the verge of sliding. This is the maximum angle θ and occurs when F1 = F2. The maximum angle θ can be solved from this. Case 1: If μs1 ≤ μs2 then the limiting case for no sliding occurs when θ = θmax (where θmax = atan(μs1), using the solution in Problem # 7). Therefore, for μs1 ≤ μs2, θ ≤ atan(μs1), for no sliding. Case 2: If μs1 > μs2 then sliding occurs only if the blocks slide down together, with the larger block pushing against the smaller block in front. The limiting case is when this is on the brink of happening, and the static friction is at its limit for both blocks. Since the blocks move together we can analyze them as one unit. 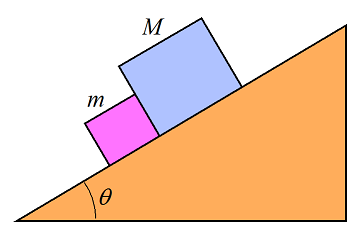 The equation for static equilibrium along the plane of the incline is: (M+m)gsinθ−Mgcosθμs2−mgcosθμs1 = 0. From this equation we can solve for θ, and this is the maximum angle θ for μs1 > μs2, for which there is no sliding. The blocks begin sliding when the force F is just large enough to overcome the static friction between the bottom block and floor. This force is the minimum pull force. The maximum pull force corresponds to the maximum acceleration that the blocks can experience without the top block slipping off the bottom block. 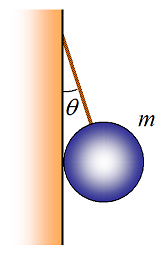 By Newton's second law, the force exerted on the top block due to contact with the bottom block is Ftop = ma, where a is the acceleration of the blocks. 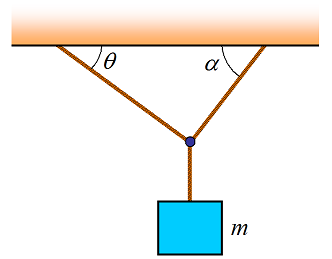 Applying Newton's second law to the bottom block we have: F−(M+m)gμk−Ftop = Ma. To avoid slipping, the maximum value of Ftop is Ftop = mgμs1. This corresponds to the maximum acceleration and hence the maximum pull force. Combine the above three equations to solve for the maximum pull force. 1. Is it possible to lift a car using fire hoses? 2. Can a sailboat stranded in calm water start moving by blowing air into its sail with an onboard fan?